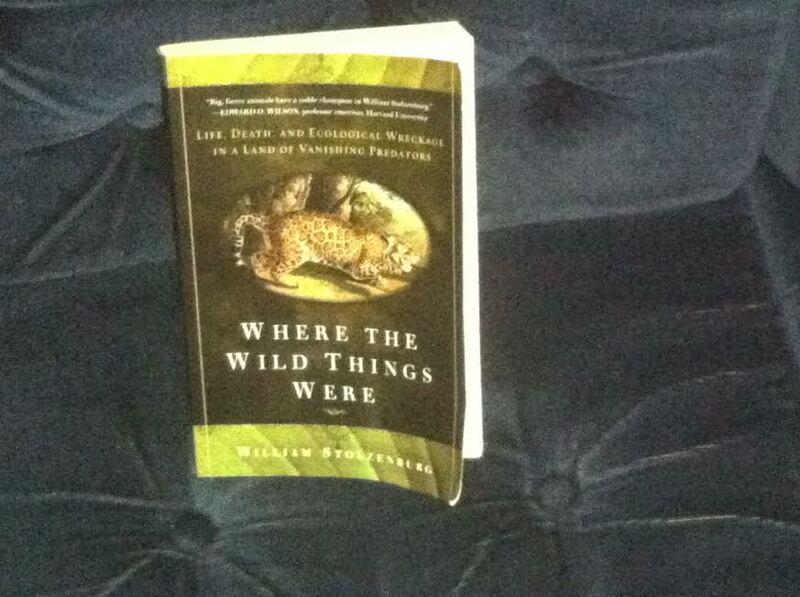 For those readers interested in ecology, we recommend William Stolzenburg’s Where the Wild Things Were. This book provides a detailed account of emerging theories of the role that top predators play in maintaining biodiversity and healthy ecosystems. The author does a great job of recounting the science as if it were a suspense filled mystery. 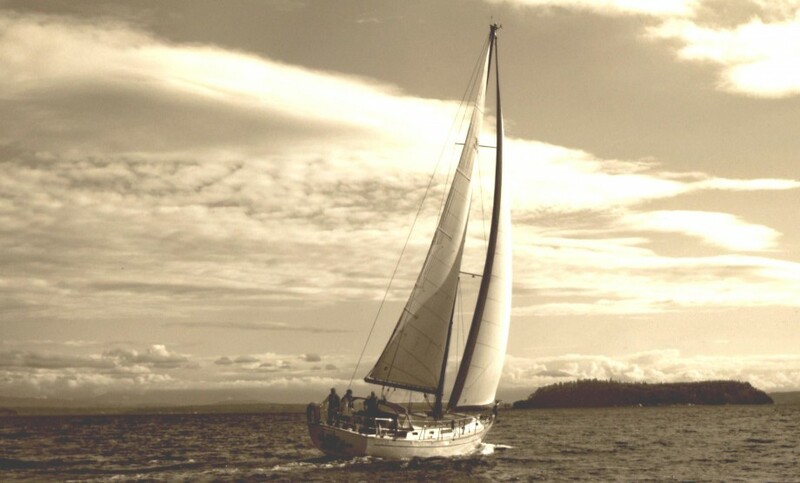 The weather assumes great importance when living on a small boat, even in relatively protected waters. We pay heightened attention to the weather when planning a passage. Four to six weeks before heading out into the Pacific we started an informal weather watch in which we shared weather information with our crew and other boats planning the passage. We were looking for well established high pressure systems in the Pacific with four day forecasts showing favorable conditions. Attached below are the NOAA Weather Charts from right before we took off. Although the charts show a mixture of high and low pressure systems (rather than the ideal highs) the forecasted winds gave us sufficient comfort to embark. 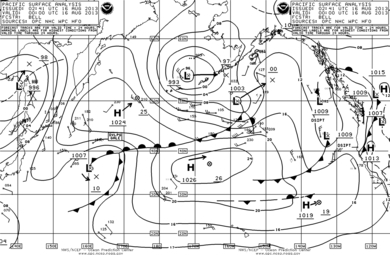 This chart shows a low off much of the Washington and Oregon coast. The small flags show wind speed and indicate fairly light air. The forecast for 24 hours later shows a high moving towards the coast. The gale south of the Aleutian chain is far enough west to not concern us and is moving north (as shown by the arrows coming off of the low). 48 hours out, there is a low and high out in the Pacific they meet at about Vancouver Island. This is not ideal, but the winds in the systems are light (no pennants with flags). On balance, these are acceptable conditions. 96 hours out, the high pressure system dominates the Washington and Oregon coast. The gale force winds are far enough south to so that we are comfortable departing. Based on the above, we elected to leave Seattle. We continued to monitor the weather. Gale conditions in fact developed on the Oregon California border and we decided to come into Newport Oregon after several days of fairly calm weather to wait for the next window. For those interested in the weather the link at the bottom of our site to the NOAA Weather and Passage Weather are good resources. 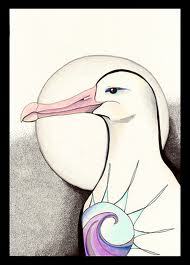 We also include a link to Lee Chesneau’s website. Lee is a retired NOAA Weather forecaster who teaches weather classes for mariners. He makes the information very accessible.